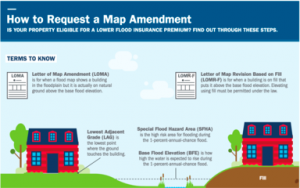 FEMA has created an easy guide that helps homeowners understand the process for Letters of Map Amendment (LOMA) and Letters of Map Revision Based on Fill (LOMR-F). This factsheet provides clear instructions on who’s eligible to apply, what should be included in an application, and what happens after you receive a determination letter. CTPs and other mapping partners are encouraged to use this at community meetings such as Open Houses. The guide can be found on FEMA.gov here: https://www.fema.gov/media-library/assets/documents/172215. Flooding is the most common and costly natural disaster in the U.S., causing millions of dollars of damages each year. Floodplain management can help communities reduce losses, protect valuable economic and natural resources, and, more importantly, save lives. Learn how communities can reduce the physical and financial impacts of future flooding through floodplain management. A challenging component of any hazard mitigation project is putting together the required cost share for FEMA partnered projects. FEMA has developed a Hazard Mitigation Assistance Cost Share Guide for Applicants andSubapplicants applying for FEMA’s Hazard Mitigation Assistance (HMA) grants: Hazard Mitigation Grant Program (HMGP), Pre-Disaster Mitigation (PDM), and Flood Mitigation Assistance (FMA). The Cost Share Guide compliments the HMA Guidance by providing an overview of the cost sharerequirements for each program and examples of various approaches for cost share strategies, such as donated resources, for the non-Federal cost share. The Cost Share Guide is available from the FEMA website: Hazard Mitigation Assistance Cost Share Guide. The New Mexico Water Resources Research Institute (NM WRRI) will host a two-day conference in May 2016 to facilitate the exchange of data and ideas among four states, three Environmental Protection Agency (EPA) regions, two Tribes, and numerous local and municipal agencies and public water systems. The conference will bring together an estimated 200 participants to gain a better understanding of the theme of the conference, Environmental Conditions of the Animas and San Juan Watersheds with Emphasis on Gold King Mine and other Mine Waste Issues. The NM WRRI will coordinate all aspects of the conference with the guidance of a planning committee comprised of representatives from some of the sponsoring entities. These sponsors include: NM WRRI, New Mexico Environment Department (NMED), New Mexico State University (NMSU), University of New Mexico (UNM), New Mexico Tech (NM Tech), New Mexico Bureau of Geology (NM BOG), City of Farmington, San Juan County, City of Aztec, San Juan Soil & Water Conservation District, and the San Juan Watershed Group. More changes are coming to the National Flood Insurance Program. This new video summarizes the changes to the NFIP Flood Insurance Manual that took effect on April 1, 2016. Many of these changes are a result of the Homeowner Flood Insurance Affordability Act of 2014 and the continued implementation of Biggert-Waters 2012. FEMA periodically issues WYO Program Bulletins related to legislative changes and clarifications to the NFIP Flood Insurance Manual. FEMA recently published Bulletin w-16022 – October 1, 2016 Program Changes. The NFIP offers free online courses covering basic and advanced flood insurance topics through the FEMA Emergency Management Institute’s Independent Study Program. Visit the NFIP Training pages for agents orclaims adjusters for course details, or view this list of NFIP coursesoffered through the Independent Study Program. Summary of the New Mexico BCEGS related to natural hazards. We currently have the locations of 149 Turn Around Don’t Drown signs on the NM TADD website and interactive map. Thank you to all of the local floodplain adiminstrators who are helping to install these signs in your community. Have questions about filing a flood insurance claim, LOMA’s, or Elevation Certificates? You can call the NFIP call center at 1-800-621-FEMA (3362) Monday – Friday from 8:00 am to 6:00 pm Central Time for help.